The Ant-Man and the Wasp trailer dropped today, and Marvel fans are loving what they see (for the most part)! Not only does Ant-Man and the Wasp look like a fun and funny Marvel Cinematic Universe adventure, it also looks to have some serious bridges to larger MCU storylines, including possible clues as to how Avengers 4 will pickup after the harrowing events of Avengers: Infinity War. However, the main point of intrigue with Ant-Man and the Wasp's storyline has always been how the sequel will chronicle the Cold War-era history of the original Ant-Man and Wasp, aka Hank Pym (Michael Douglas) and Janet van Dyne (Michelle Pfeiffer). Now, some fans think they've caught a glimpse of the original Wasp in the new Ant-Man and the Wasp trailer. The shot in question comes at the 1:34 - 1:35 mark in the trailer. 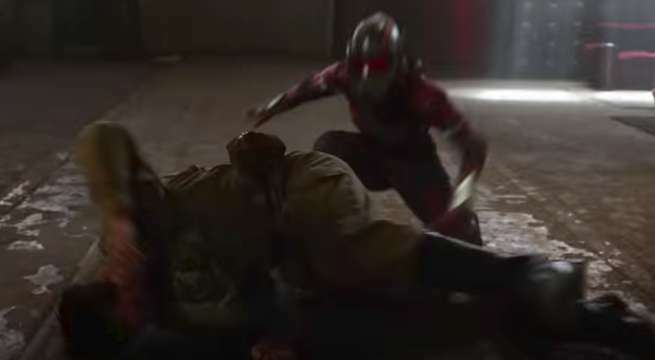 The blink-and-you-miss-it sequence sees Ant-Man and Wasp in a tag-team combat moment: Ant-Man punches a guy into the air, and Wasp comes out of shrink-mode to lay the aerial smackdown. Looking closely at the shot, it quickly becomes apparent that the Wasp costume seen in that moment isn't the one that Evangeline Lily's Hope van Dyne wears. Upon closer look, this entire sequence seems to be a flashback, set in the Cold War days with the original Ant-Man and Wasp. The room and the soldier both look like Soviet-era military, and the Wasp costume is clearly the red and black design of the classic Wasp, and not the yellow and silver look of the new costume. If anything, the sequence could be the full flashback to the day that the original Wasp vanished, as we know that tragic events involved a mission to stop a Soviet rocket, which went horribly wrong. If nothing else, this sequence proves just what a formidable team Ant-Man and The Wasp were, while setting the blueprint for what Scott Lang and Hope van Dyne's Ant-Man / Wasp partnership should be, by the end of the film. Meanwhile, Pfeiffer's Janet van Dyne will be a crucial piece ot not only Ant-Man and the Wasp, but quite possibly Avengers 4 as well. Janet is expect to re-emerge from the Quantum Realm in Ant-Man 2, and the knowledge she brings could be pivotal into helping Hank Pym and Co. develop a means to stopping Thanos and reversing his destructive act in the Infinity War sequel. How excited are you for Ant-Man and the Wasp? Let us know in the comments! Avengers: Infinity War is now in theaters. Other upcoming Marvel Cinematic Universe movies include Ant-Man and the Wasp on July 6th, Captain Marvel on March 8, 2019, the fourth Avengers movie on May 3, 2019, the sequel to Spider-Man: Homecoming on July 5, 2019, and Guardians of the Galaxy Vol. 3 in 2020.